At the risk of showing this "Contentment" quilt ad nauseum, I made a real effort to take some decent pictures yesterday...then I scheduled an appointment with a real photographer 75 miles away in Huntsville. The close ups of the blocks and borders look dull and a little dark, as well. I'll be watching and waiting for my new picture CD to come in the mail! I have gotten used to the effect of the hand quilted stippling. At first, I thought it was too severe, but I like how it makes the applique motifs "pop." I quilted the larger applique motifs so there wouldn't be too much puffy "popping." The quilt top started 59 x 59 inches. The stippling caused it to shrink a half inch on all sides, so it is now 58 x 58 inches. Thank God it shrank uniformly so that it lays nice and flat. It turns out that the photographer that I chose had taken most of the pictures of the Gee's Bend quilts for publication. So I have made my Sauder Village Quilt Show deadline, and yesterday afternoon I registered online for the juried Grand Rapids, Fall Paducah, and Des Moines AQS shows. I told my husband that his quilt may be traveling for a while. As usual, my quilts end up traveling more than me, sigh. I intend to go to all the shows except Des Moines. The quilt is more square than the next picture indicates...now you see why I need a professional! This starts the progression of the border, in order, all around the quilt. I started with the top, left-hand corner. This top border is the last one I stitched and applied to the block portion of the quilt. Here starts the right border, at the top, going down. And the bottom border, starting on the right and going toward the left....it was stitched and applied first. And finally the left border, starting at the bottom and working up. The two side borders were stitched and applied after the bottom border. They are mirror images except I used different fabrics for the left one. Have you figured out my trick with how I did my borders so they would APPEAR to go around corners?? It is a trick I saw on someone's posting of an Australian Quilt Show. By applying the bottom border first, then the two sides, then finally the top, it allowed me to do each border by my applique method, then plunge each one into water to soak out the glues before trimming to size and applying (without having to dunk the whole quilt). 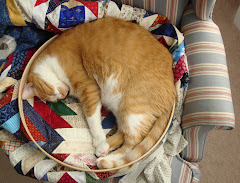 I find it difficult to get a quilt top back to square after dunking it when it is all stitched. Even though I pre-wash my fabrics, I find the 100% cotton thread shrinks and can cause the seams to pucker. There are times I just do needle turn applique when I need to apply final motifs to corners. I am not very good or fast at that method, but I can do it when there is a gun to my head, LOL! It meant that I had to carefully execute the design and the process, but it worked. I will be trying that trick again (you can easily start at the top). Here is my label, and no...my printing is not this good. I cheat. I type out my label in Microsoft Word with everything perfectly center-justified on my computer. Then I highlight all of it and go "shopping" through the font selections. I then print it out on paper in the size that will work and trot off to my light table. I press freezer paper to the back of my label fabric to make writing on it easier. I tape the paper down to my lightbox, position my fabric, tape it down, then I trace the font with my Pigma pen. The name of this font is "Kirsten ITC." Oh sweetie - this is just awesome!! I wish you all the luck with this quilt in it's many shows. Keep us posted on how well she does. I certainly do not get tired of looking at photos of your gorgeous work!! Wow the details are marvelous and knowing you did all that stippling through dream select batting - I'm in awe! So interesting to read about your stitch shrinkage - I never write down my before measurements so by the time I have a finish I have no idea. Absolutely stunning! I don't think I would ever get tired of looking at this. I hope you will submit it to Houston and to ROAD in California so I will get to see it in January. Wouldn't you like a trip to southern CA in January 2018? Clever trick for neat handwriting on a label! The quilt is wonderful. I wish it much success at the shows. Stunning! What a work of art. Always a pleasure to read your blog. I never get tired of looking at this quilt. I see a new detail every time. Good luck in the shows. I'll have to go to Paducah in the fall just to see it in person! This quilt is truly jaw-dropping! I could look at it forever. Best of luck in all the shows and please let us know how it does!! Love to read your blog and can't wait to see what you are up to next! Exquisite! Good like with the show entries. I don't know if I could give it up, even for a while. And that's exactly how I do my labels. I'd never get them centered and evenly spaced if I did them free hand. Your work is impeccable. I enjoyed the journey you took us on while working on this quilt. Good luck in the shows. I think your quilt is a winner. This is the most fantastic quilt with precision detail and memories all wrapped up together. It is a prize winner as far as I'm concerned. I continue to be blown away by this incredible expression of love in stitches, every time you show more photos of the detail. It's just an amazing quilt! I love your use of whimsy and color in this wondrous piece! Thank you so much for sharing your trip thur the process of creating and finishing this piece. Congratulations, dear girl!!! What a joy to see it all finished. I know folks all over are going to enjoy seeing this. I was told about that method for the labels just recently and since I don't seem to do labels, it seemed an easy way to do something decent. I'll be trying it on the 12 quilts for my nieces and nephews that are being bound right now. Take a breather, friend. I can't even put into words how much I love this quilt--so creative and charming! Congratulations on a wonderful finish! It's just fabuloso!!!! No words to capture it! An absolute masterpiece. And such an inspiration. May it capture hearts across the country (and awards too!). It's fantastic, and great to see all those close up photos thank you. I've loved seeing your progress on this beautiful quilt and enjoyed looking at the fine details in all your photo's. Wishing you all the best at the quilt shows. Congratulations on the finish. Just beautiful. Wonder how many quilt stitches you have in it? Hope you win every show. It's fabulous Teresa! I love the pure and happy colours! 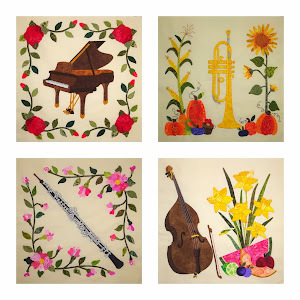 There are so many creative touches and special designs in the applique and in the quilting. You could look at it for hours and still find more details you didn't see before! A beautiful master piece. As it travels, maybe I will get to see it in person! How wonderful to make a quilt of your life !!!!!! Teresa, your quilt is gorgeous! I wish I could see it in person at one of the shows you have entered it in but I don't think I'll be going to any of them. You are so creative. I just love your work! What a beautiful quilt, and it is finished! Hooray! Saw this quilt today at the Sauder Farm Quilt show. Wonderful work!